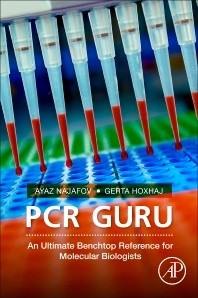 PCR Guru: An Ultimate Benchtop Reference for Molecular Biologists is provides researchers in molecular biology with a handy reference for approaching and solving challenging problems associated with PCR setup and optimization. As a laboratory guide, it emphasizes the technical aspects of employing PCR as a tool in molecular biology laboratories. The book covers the history of PCR and the basic science underlying it. It then discusses PCR at the bench level, starting with detailed description and tips on primer design, and continuing with the standard protocols used to perform PCR. Ayaz was born in Baku, Azerbaijan. He obtained his BSc and MSc degrees in Molecular Biology and Genetics from Bosphorus University, Istanbul, Turkey and got a 2-year training in Biochemistry as an intern at Baylor College of Medicine, Houston, Texas, USA. Ayaz pursued his PhD in Biochemistry at MRC Protein Phosphorylation Unit at Dundee University, Scotland, UK in Prof. Dario Alessi’s lab. Ayaz is currently a postdoctoral fellow in Prof. Junying Yuan’s lab at Harvard Medical School, Cell Biology Department. Gerta was born in Fier, Albania. She obtained her BSc degrees in Molecular Biology and Genetics, as well as a second major in Chemistry from Bosphorus University, Istanbul, Turkey. Gerta pursued her PhD in Biochemistry at MRC Protein Phosphorylation Unit at Dundee University, Scotland, UK in Prof. Carol MacKintosh’s lab. Gerta is currently a postdoctoral fellow in Prof. Brendan Mannings’s lab at Harvard T.H. Chan School of Public Health, Department of Genetics and Complex Diseases.